We've all seen many blog posts about how to install draperies correctly, but I see so many done incorrectly all of the time that I feel the need to touch on this topic as well. I like draperies to be hung as high as possible. Typically, I will mount the rod right below the crown molding, but depending on the window height and room height (if there's a ton of space between the window and the ceiling), I might mount the rod halfway between the top of the window molding and the ceiling. If you're purchasing off the shelf draperies, make sure they will be the right length. If they are too long, get them hemmed- if they are too short, look for another brand that may sell longer sizes or wait to get custom ones made. Hang them so they just touch (or "kiss") the floor. I never like to puddle or have a "break" in the fabric - it's just not my style, but they must never, ever be off the floor. Or ever just hitting the windowsill. That's a big no-no!! Most stocked panels come in "single-width" size. This size is okay for narrow windows, but if your windows are wider, double-width is the way to go. By using the right size width, your windows will look wider (which is a good thing!) and your draperies/window will look balanced. Hardware should be mounted about 6 inches past the window, and panels should rest on the outside of the window, just covering the window molding because drapes should frame the view, not block the light! Always make sure the draperies you are choosing are lined- they have more weight to them which helps them hang better, and they look more custom. Here are my go-to draperies that I suggest frequently when budgets are tighter- I own them myself too! *choose ring style over grommets- more of a custom look! I regularly organize around our house. It gets harder and harder as the kids acquire more "stuff" and we live in a small space to boot. However, I enjoy getting rid of things we don't use, having everything in it's place, and a place for everything. It feels good and satisfies my OCD tendency :) And is super easy to clean up if you know where it all goes. No better time to check this off the list than the start of a New Year. 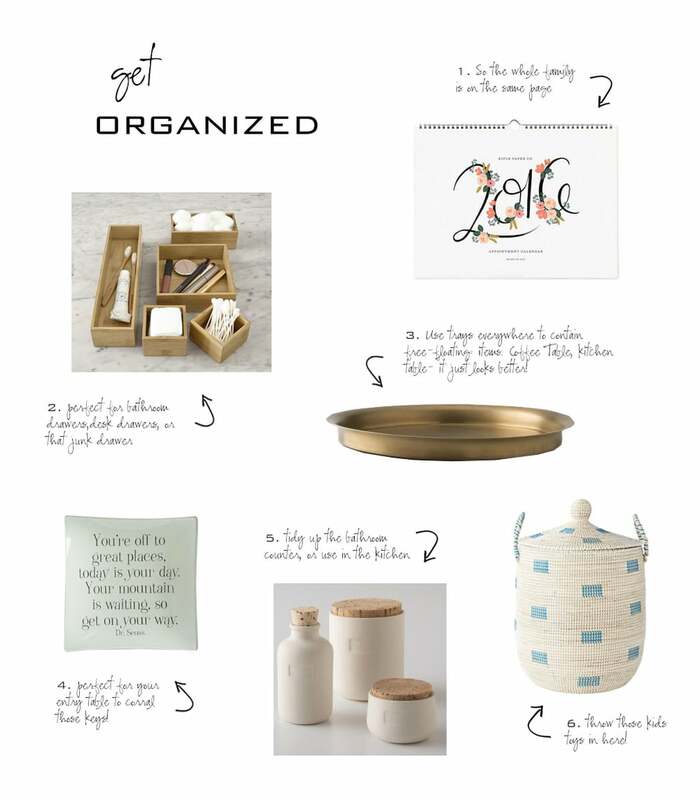 Here's a round-up of some easy solutions to corral and organize your "stuff" in all areas of your home!